A sharp intellect radiates from Abul Mayen, a magnetic young mother of two with a gleaming bright smile. Her charisma infects the people around her, and her sharp wit keeps them laughing, which is not an easy task amidst the havoc, struggle and hunger. Mayen is living in a squalid, sprawling improvised settlement in Puktap, a remote hamlet that is growing with the arrival of people fleeing ongoing violence in the middle of South Sudan. Until Catholic Relief Services began distributing food here, the hunger was wrenching. “Our lives are heavy,” Mayen says, when we meet at her home. Her smile was gone; her wit, hidden. “I came here in December, because there was no more food in the camp where I was staying.” That was in Awerial, a major town across the Nile River from Puktap, where many villagers converged to escape the conflict that has consumed South Sudan’s countryside since 2013. Mayen says that when the United Nations refugee agency, UNHCR, started giving out half rations because of funding shortfalls, she suddenly didn’t have enough food to feed her family. The locals are killing off the wildlife to survive, but now even wild animals are scarce. Only 21, Mayen has a baby daughter and a son who’s around 6. 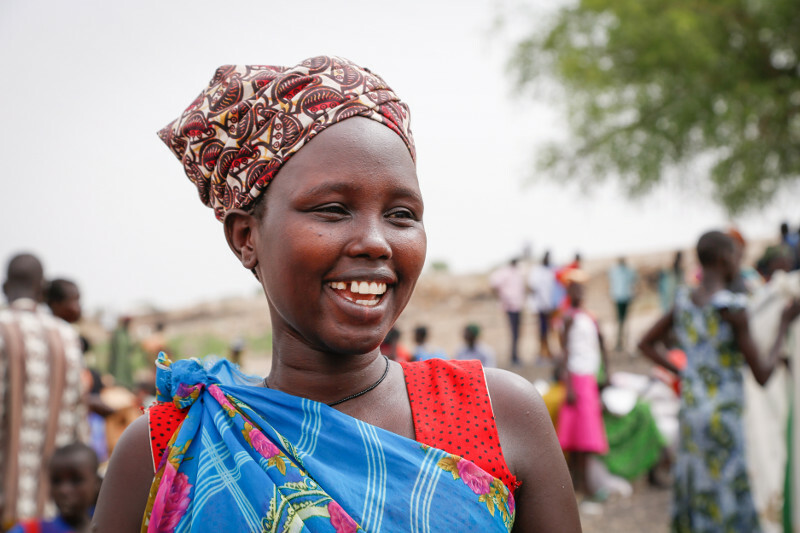 Like many South Sudanese men, her husband was killed in the violence. She left her home village, Duk Payuel, when it was torched during the night in 2013, stumbling over bodies as she fled with her children. Now she lives in this camp for displaced people on the plains around Puktap, which used to be filled with scattered huts and villages. It’s hard to imagine that now. A broken-down borehole in an overgrown field is the only evidence that there once was a village. Back then, people would fish the teeming waters when the Nile overflowed. 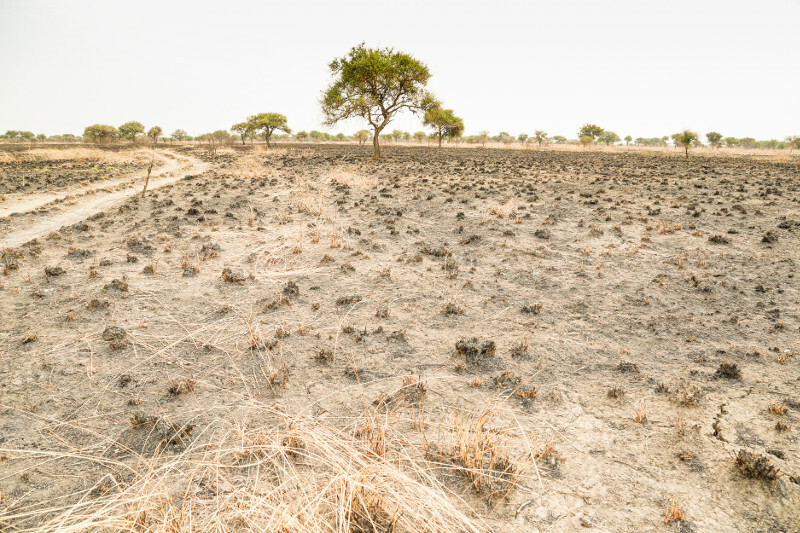 After the water receded, fertile fields were left behind, but for decades now—since 1991—they have lain fallow, with no one daring to plant. When South Sudan declared independence from Sudan in 2011, ending decades of civil war, the South Sudanese hoped for a better future. People began to rebuild, till their land, and reclaim their lives. But in 2013, when the ruling party had a violent falling out with the opposition, the fledgling country went up in flames. A fragile ceasefire in 2015 never took hold, and in July 2016 violence erupted again. Now, it’s reaching places that had seemed immune to the brutal inhumanity seen in many parts of South Sudan. Famine has been declared in two counties. And the situation keeps deteriorating. Some 4.9 million don’t have enough food—and the number is expected to increase to 5.5 million by July, if the insecurity prevents people from planting. The United Nations says 100,000 children are in imminent danger of dying from hunger. CRS is providing food assistance in Puktap through the Resilience and Food Security Program funded by the U.S. Agency for International Development Food for Peace program. 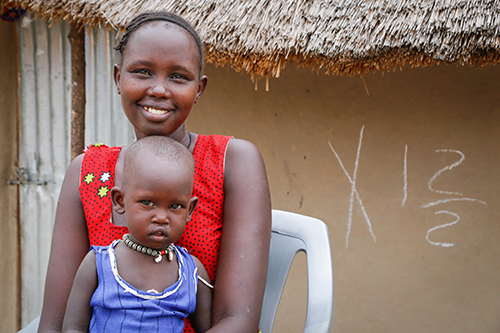 It helps newly displaced people, like Mayen, with direct food donations. When peace returns, the program offers food for work building community infrastructure like roads that link remote villages or irrigation canals that turn fallow fields fertile. Puktap has always included people from different ethnic backgrounds, but before the latest conflict they were working hand in hand to reweave the social fabric frayed by decades of violence and cycles of revenge. When the drought-delayed rains come, CRS will provide people with seeds so they can plant if security permits. Mayen says she will try to plant, but near Puktap, where she feels safe. “I have to try farming again so we can eat. I cannot just sit idly by,” she says. If there wasn’t so much insecurity, she says, she would go home to Duk Payuel. “Whenever I ask people, where does all of this food come from? Who is giving this to us? People say, it comes from the Americans,” Mayen says. “Why can’t the Americans also help us with the violence?” she asks.